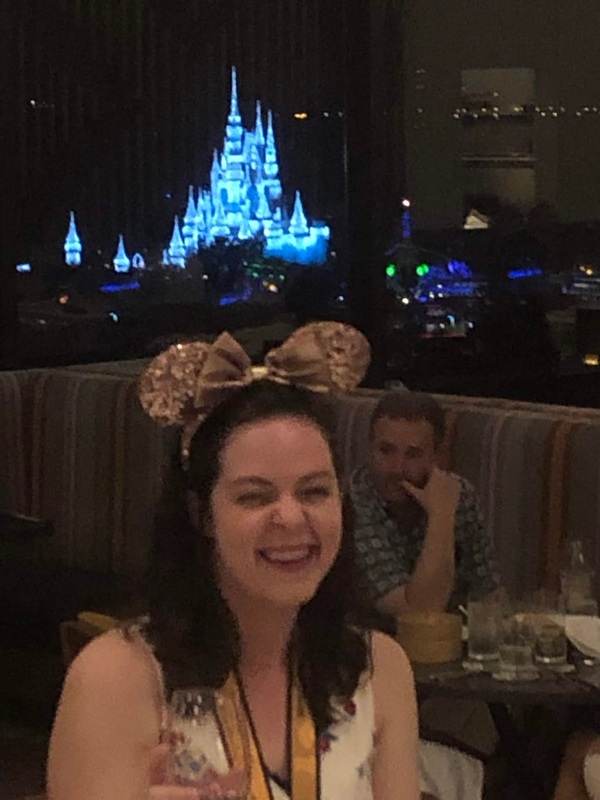 I bolted out of my Jiko dinner with one objective in mind: sneaking into the California Grill to watch the Happily Ever After fireworks. With that goal in my sights, I hopped a bus to the Magic Kingdom from AKL and then walked over to the Contemporary. Surprisingly, I was not the only hopeful solo patron hanging around the check-in desk hoping to be granted access to this exclusive establishment. But they let me onto the elevator within about 5 minutes and I had a seat at the bar 10 minutes after that. With 45 minutes to spare before the fireworks, I ordered a glass of Malbec and settled in. My seatmate was wearing a Dopey jacket and subsequent medals, and we ended striking up that sort of very specific whirlwind mini-friendship one often finds in the Walt Disney World/runDisney community. Or is that just me? Am I hella intense?! DO I MAKE PEOPLE TALK TO ME??? Anyway. The fireworks were early that night - 8pm - and with the assurance that I could keep my seat at the bar I scooched out onto the observation deck to take it all in. Honestly, the view isn't all that great, and depending the winds they fireworks can be super skewed by comparison to the castle, as they were this night. But it really didn't matter; it was the music and the proximity that made me feel happy. I wouldn't be shocked if every night the fireworks are the unofficial signal to clear out of the CA Grill, and things settled down significantly back at the bar. Our bartender was able to slow down enough to chat a bit with us, and even took unsolicited photos of us with the castle. Here I am demonstrating the face a bunny makes. Right before the last call, some random businessmen showed up and bought me a glass of wine, which I'd heard of being a thing that can happen but not generally encountered personally in real life let alone WDW. Rare occurrence or not, that extra glass of wine led me to basically shut down the bar! I'm so glad I decided to spend my evening this way. The fireworks are always lovely and something about the magic of WDW makes everyone a friend. Single individuals seem to be accommodated pretty easily, too. Solo WDW is the best!